Focus Sat: New frequency for CT 1: 11804.00MHz, pol.V (DVB-S2 SR:30000 FEC:3/4 SID:30311 PID:601[MPEG-4]/611 Czech- Conax & Cryptoworks & Irdeto 2 & Nagravision 3). Focus Sat: A new channel has started in DVB-S2 Conax & Cryptoworks & Irdeto 2 & Nagravision 3: CT 1 (Czech republic) on 11804.00MHz, pol.V SR:30000 FEC:3/4 SID:30311 PID:601[MPEG-4]/611 Romanian. A new channel has started in DVB-S2 Panaccess: CT 1 (Czech republic) on 11931.00MHz, pol.V SR:30000 FEC:3/4 SID:21 PID:1211[MPEG-4]/1212 Czech. CT 1 is back on 11366.00MHz, pol.V SR:30000 FEC:2/3 SID:14 after a break ( PID:7511[MPEG-4]/3010 Czech,3033 Czech - Irdeto 2). A new channel has started in DVB-S2 Irdeto 2: CT 1 (Czech republic) on 11324.50MHz, pol.V SR:30000 FEC:3/5 SID:14 PID:3008[MPEG-4]/3010 Czech,3033 Czech. SkyLink: CT 1 (Czech republic) is now transmitted Free To Air (12070.50MHz, pol.H SR:27500 FEC:3/4 SID:13140 PID:2310/2320 Czech,2321 qaa,2322 Czech). SkyLink: New frequency for CT 1: 12070.50MHz, pol.H (DVB-S SR:27500 FEC:3/4 SID:13140 PID:2310/2320 Czech,2321 qaa,2322 Czech- Cryptoworks & Irdeto 2 & Viaccess 5.0). New frequency for CT 1: 12363.00MHz, pol.V (DVB-S2 SR:29500 FEC:3/4 SID:4911 PID:5511[MPEG-4]/5521 Czech,5531 qaa- Irdeto 2). 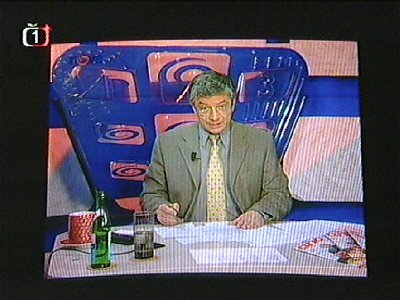 Digi TV: CT 1 is now encrypted in Nagravision 3 (12687.00MHz, pol.V SR:27500 FEC:3/4 SID:2900 PID:621/854 Czech). Digi TV: CT 1 (Czech republic) is now transmitted Free To Air (12687.00MHz, pol.V SR:27500 FEC:3/4 SID:2900 PID:621/854 Czech). CT 1 switched to Astra 3B satellite at 12525.00MHz, pol.V (DVB-S , 12525.00MHz, pol.V SR:27500 FEC:3/4 PID:162/88 Czech,91 original audio). UPC Direct: New frequency for CT 1: 11881.00MHz, pol.V (DVB-S SR:28000 FEC:7/8 SID:20315 PID:101/111 Czech- Cryptoworks & Nagravision 3). UPC Direct: CT 1 is now encrypted in Cryptoworks & Nagravision 3 (11727.00MHz, pol.V SR:28000 FEC:7/8 SID:30106 PID:351/361 Czech). UPC Direct: CT 1 (Czech republic) is now transmitted Free To Air (11727.00MHz, pol.V SR:28000 FEC:7/8 SID:30106 PID:351/361 Czech). UPC Direct: A new channel has started in DVB-S Cryptoworks & Nagravision 3: CT 1 (Czech republic) on 11727.00MHz, pol.V SR:28000 FEC:7/8 SID:30106 PID:351/361 Czech. T-Home: A new channel has started in DVB-S2 Conax: CT 1 (Czech republic) on 10806.00MHz, pol.V SR:30000 FEC:2/3 SID:4008 PID:81[MPEG-4]/80 aac Czech. CT 1 switched to Astra 1M satellite at 12382.50MHz, pol.H (DVB-S , 12382.50MHz, pol.H SR:27500 FEC:3/4 PID:101/111 Czech). Digi TV: A new channel has started in DVB-S Nagravision 2: CT 1 (Czech republic) on 12686.00MHz, pol.V SR:27500 FEC:3/4 SID:2900 PID:621/854 Czech. UPC Direct: New frequency for CT 1: 12382.50MHz, pol.H (DVB-S SR:27500 FEC:3/4 SID:20315 PID:101/111 Czech- Cryptoworks). CT 1 is testing in DVB-S Clear & Cryptoworks on 12525.00MHz, pol.V SR:27500 FEC:3/4 SID:3 PID:162/88 Czech. UPC Direct: A new channel has started in DVB-S Cryptoworks: CT 1 (Czech republic) on 10920.75MHz, pol.H SR:22000 FEC:5/6 SID:20342 PID:151/161 Czech. CT 1 is now encrypted in Cryptoworks (12607.00MHz, pol.H SR:27500 FEC:3/4 SID:3 PID:162/88). CT 1 (Czech republic) is now transmitted Free To Air (12607.00MHz, pol.H SR:27500 FEC:3/4 SID:3 PID:162/88).